The PWC Galvanized Steel Cradle is made for personal watercraft or small boats from an overhead boat lift. Available in single or dual option. Completely adjustable to the personal watercraft. Hot dipped galvanized steel. Cradles ship UPS freight and can be handled by two adults. Cradles are easy to install. Adjustable hardware included. Most commonly used design for cradles. 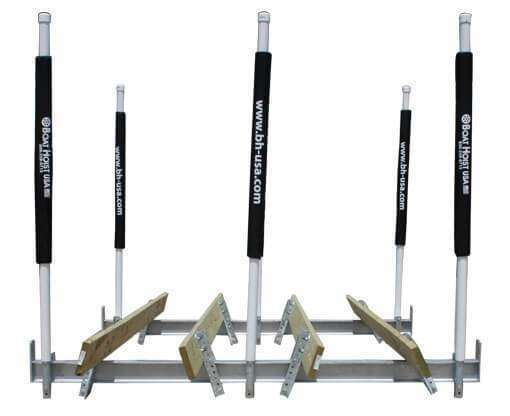 I-beams allow for equal cable distribution and eliminates the liability of cable slack that platform cradles can cause during the lifting process. Add optional cable savers to keep the cable out of the water. All galvanized steel cradles are for inboard and outboard boats. Chock angles included allows you to mount two wood bunks. Wood bunks not included. Shown with optional Guide Posts and padded bumpers.